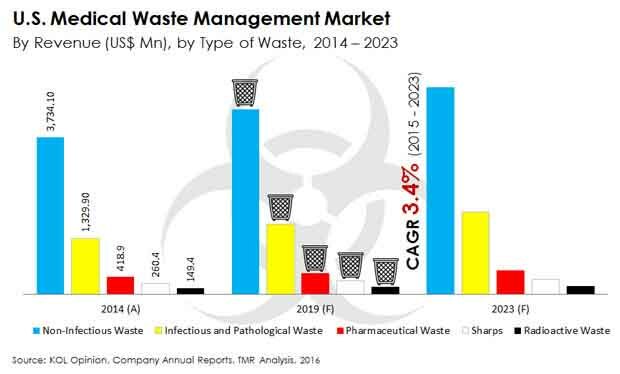 The U.S. medical waste management market is largely oligopolistic in nature, characterized by a handful of large companies and several small and medium-scale players dominating the market, notes Transparency Market Research (TMR). Stericycle, the largest regulated waste management company in the U.S., was the only company to occupy a major market share; the company accounted for a significant share of 23.2% in 2014. However, the combined market share of all small-scale medical waste management companies in the U.S. was estimated to be 53.1% in the same year. Several large companies and new entrants in waste management are actively considering the strategy of acquiring small and medium-scale players. The strategy of mergers and acquisitions will help them in enhancing operational efficiencies, augmenting service capabilities, and consolidating their customer base across the U.S. in the forthcoming years, finds TMR. The U.S. medical waste management market is featured by a low-to-medium level threat of new entrants. Setting up a medical waste management system can be capital-intensive for many new entrants, characterizing the presence of medium entry barrier in the market. According to TMR, the U.S. market for medical waste management is forecast to rise at a CAGR of 3.4% from 2015 to 2023 for all its waste types, measured in terms of revenue. The market revenue was estimated at US$6.35 bn by the end of 2016 and is anticipated to expand to US$7.99 bn by the end of the forecast period. Based on the type of medical waste, the U.S. medical waste management market is segmented into sharps, non-infectious waste, infectious and pathological waste, radioactive waste, and pharmaceutical waste. Of these, the non-infectious segment dominated the market by accounting for a major share of 63% in the U.S. waste management market in 2014; this was followed by the infectious waste segment. However, in the coming years, the segment of infectious and pathological waste is expected to expand at a higher CAGR of 4.3% during the forecast period. The substantial growth of the segment is attributed to an upsurge in the generation of volumes of infectious wastes from several pathological labs in the country. Rising geriatric population, coupled with spiraling number of medical services and diagnostic tests attributed to a significant ailing population, has translated into significant generation of medical wastes, propelling the segmental growth. The U.S. market for medical waste management is primarily driven by numerous intensive initiatives and sustained efforts taken by the government and several NGOs to manage medical and pharmaceutical waste. Combined with this, the generation of vast volumes of medical waste from pharmaceutical companies, hospitals, diagnostic laboratories, and pharmacy centers has spurred the demand for medical waste management services. Stringent regulatory policies pertaining to emission, disposal, and recycling have stimulated spending by various healthcare and pharmaceutical companies to manage medical waste. For instance, leading regulatory bodies such as the U.S. FDA, the EPA, and the DEA are working collaboratively to ensure the proper management of medical and pharmaceutical waste in the U.S. In recent years, a large number of government bodies have been instrumental in creating awareness regarding environmental-friendly medical waste disposal methods by working closely with healthcare facilities and pharmaceutical companies. These factors have boosted the market. The high cost involved in setting up medical waste management facilities and issues concerning adherence to strict regulatory norms in the U.S. may deter many waste management companies from entering the market. In addition, the provisioning of proper number of transportation vehicles, along with the substantial time and cost involved in getting licenses for regulated waste management, is a factor that is likely to hinder the market growth to some extent. Be that as it may, a large number of companies are forging long-term contracts with several small quantity waste generators to leverage the benefits of higher profit margin. In addition, technological advancements and innovations in off-site medical waste disposal methods are expected to create new revenue streams for market players along the forecast period. Furthermore, the continued emergence of non-incineration waste technologies such as steam autoclave and non-ionization radiation treatments is anticipated to make medical waste management less capital-intensive. The study presented here is based on a report by Transparency Market Research (TMR) titled “Medical Waste Management Market (Type of Waste - Sharps, Infectious and Pathological Waste, Non-infectious Waste, Radioactive Waste, Pharmaceutical Waste; Service - Collection, Transportation, and Storage, Waste Treatment, Disposal Method) - U.S. Industry Analysis, Size, Share, Growth, Trends, and Forecast 2015 - 2023”.